When people first started coming to me complaining of Dry Eye, it felt to me like one of those fabricated diseases doctors invent to sell prescriptions or operations. You might as well say you have Cut Finger, or Bruised Knee, or some other temporary condition which will heal on its own, I thought. I’ve always cried easily, so maybe that’s part of why I’ve never had this problem myself, and wasn’t too sympathetic to those with it, which I’m sorry about now. I realize Dry Eye can be very uncomfortable or even painful for many people. I do know it’s not a sign of a deficiency of eyedrops! Tears are the natural lubrication fluid for the eyes, spread over the eyeball easily with each blink. The healthy eye blinks every couple of seconds, softly and gently like butterfly wings, more often if it’s windy or in very bright light. Many people get into the bad habit of staring, especially at the computer, not blinking for long periods of time, so the tear film on the surface of the eyeball starts to evaporate, which becomes very uncomfortable. Begin paying attention to yourself and notice whether you’re blinking enough. Don’t force it: it should be soft and easy. If you’re dehydrated in general, maybe with chapped lips or dry skin, it’s no wonder if your eyes are dry too. Are you drinking enough water? Don’t kid yourself that caffeinated drinks are an adequate replacement for good quality clean water. Ingesting caffeine will cause the body to use its own water to excrete this toxin. 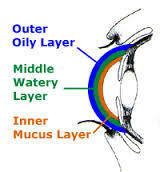 Tears are composed of oil as well as water (see the photo above). Make sure your diet contains healthy oils like those found in walnuts or salmon. Or you might consider taking a supplement containing omega 3 oils, if you’re concerned that you aren’t getting enough of this important nutrient from your food. If you’re waking up with dry sore eyes, you’re probably staring in your sleep. The healthy eye is always in motion, tiny little saccadic movements scooping up the photons to paint the image in your brain of what you’re seeing. This happens when your eyes are closed during sleep too, as you scan the scenes in your dreams. Watch someone sleeping and you’ll see their eyeballs moving under their closed eyelids. If you suspect you’re staring in your sleep, Dr. Bates’ Long Swing will start to break up the stare. Stand and slowly twist your body from one side to the other, noticing the view around you slide by in the opposite direction. You turn to the right and the room or scenery slides by to the left, you twist to the left and the view slides rightward. Just let the upper torso, shoulders, head, and eyes follow along for the ride as you rotate yourself from the hips. Do a few minutes of these before sleep, and you’ll wake up with more relaxed moist eyes. A side benefit is that Long Swings are a great help to reducing neck tension, which can accompany eyestrain. For more about the Long Swing exercise, see this. When I lead vision clients in a palming session, I often guide them to visualize and imagine their eyes as healthy, clear-sighted, vibrant, moist, and alive. During palming you can imagine your eyes melting into the healing warmth in your hands, softening and resting, not having to do anything, not having to try to see, or to strain. These visualizations are much more than “mind games”, as the body believes the images you send it from your brain. So why not see your eyes as soft and mobile and relaxed and sparkling, with plenty of moisture like a bright green leaf just washed by a rain storm? Life came from the salt water of the sea, and babies grow in the amniotic fluid of their mother. Moisture gives rise to life, so enjoy having your eyes joyously and juicily alive. Thanks for reading, Sis! This is a surprisingly (to me) common problem. Previous Previous post: Can Cataracts Be Healed Naturally?